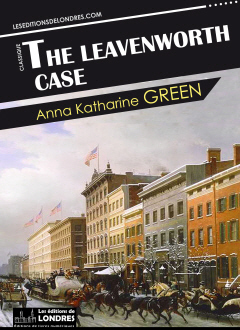 “The Leavenworth case” is a crime novel written in 1878 by American writer Anna Katharine Green. This book, often referred to as a criminal romance, is considered to be the first crime novel written by a female writer. It is also widely acknowledged as having influenced Agatha Christie: she claims to have discovered it when she was eight. The action is set in New York City. The body of a wealthy merchant is found in his New York mansion. The detective Ezeneber Gryce is introduced. At the heart of the mystery are two cousins, Eleanor and Mary. The reader is quickly led to believe that one of the two girls is behind the murder. In spite of its numerous innovations, and the constant willingness to trick the reader with the exposé of evidence which ends up being circumstantial (leading the Yale Law school to use her books to make a point), the novel is at its core a criminal romance, love being behind most of the human motivations, even the darker ones.